Rembrandt was a celebrity in his own 17th-century lifetime, one of the highest paid painters of his day. Before the invention of photography, all famous people – as well as members of your family if the budget stretched that far – had their portraits painted. There was no other way of visually recording an event or what a person looked like. 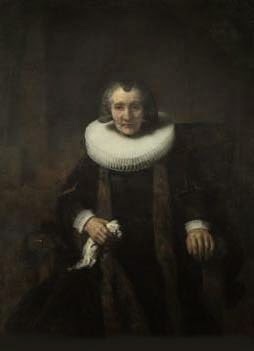 The number of portraits Rembrandt painted attests to the number of people who wanted to have his pictures on their walls – and in addition have a ready reference to his distinctive style. One can imagine the 17th-century dinner guest exclaiming: "unless I'm very much mistaken, that's a work by Mijnheer Van Rijn on your wall". And the host would blush and look modest. It's a tradition that carries on today. No prime minister or president leaves office without having a portrait painted to be hung up with their predecessors. The same applies to unique groupings – whether school, college, family occasion, or committee – although the visual record here is more likely to be photographic. 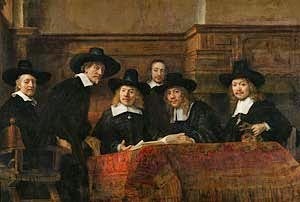 Rembrandt was commissioned to produce a work to decorate Amsterdam's New Town Hall in the Dam. His subject was this 1st century AD revolt against Roman rule, recorded by Tacitus (see picture credits below). It is a story intimately interwoven with Dutch nationhood. The Batavi, a Germanic tribe, settled the delta land of the lower Rhine – an area that centres on the city of Nijmegen. Rembrandt must have intended the painting to speak to his 17th-century compatriots of the heroism shown by this small band of men against the might of Rome. Nevertheless, the painting, although installed, was removed soon afterwards and returned to the artist. You can read about it here. Cuts were made in the original canvas to preserve the group around the table, and the picture was then reframed. The painting as it exists today nevertheless measures 196 cm × 309 cm (77 in × 122 in). And the painting is certainly more appreciated now – it takes pride of place in Room 2. Thus, due to this exceptional loan from the Royal Academy of Fine Arts in Stockholm, London has been able to show the Dutch a work by their most famous painter, that speaks anew to them of their illustrious and determined origins. 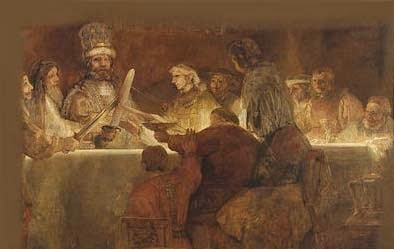 Note how Rembrandt has lit his scene of Civilis exorting the others to action. The light seems to come from within the room – as if we are actually viewing that candlelit scene some 2000 years ago. This is a virtuoso work among virtuoso works. 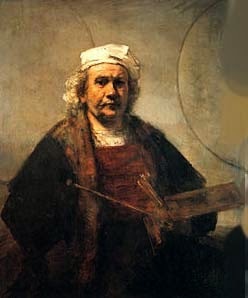 The reaction of Rembrandt's contemporaries must have been something like "but he makes it all look so easy!" He models the face in his usual painstaking manner and then swiftly, insouciantly almost, sketches in the white cap on the head and the hands holding those oily pastes of pigment and that bunch of brushes I referred to earlier in Part I. This is a portrait completed in the last 5 years of his life, his wife Saskia dead, his common law wife Hendrickje dead, and his debts still mounting in spite of the liquidation of his assets/business and the loss of his house. Look at the bravado. The painting is the work of a genius. Look, he is saying, I can even draw a perfect circle, not once, but twice. Nobody might be buying my paintings at the moment (they were of course accepting them as security against his loans), but maybe they will in the end. The painting is loaned by the Iveagh Bequest, Kenwood House. This is another large commissioned work, this time for the Amsterdam merchants charged with overseeing the quality of woven and dyed cloth. How dignified they are, how soberly suited, how uniformly focused on the work in hand. The artist could have shown these worthy Syndics as a conventional grouping of high-powered suits round a table. Thankfully he didn't. He infuses the group with the kind of dynamism that lets the viewer imagine them not only as performing their duties but doing so with humour and good fellowship. This is a painting from the National Gallery's own collection of Rembrandt's work. Margaretha de Geer is elderly, frail, and yet, in her quiet way, radiant. How artists of this period and earlier vied with one another to paint the perfect stiff lace ruff and wrist cuffs. Those are surely one of the most potent symbols of signification for a high born person who didn't have to do the washing up, milk the cow or fetch the coal. The painting takes the breath away. 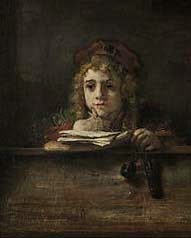 This is Rembrandt's son, Titus van Rijn. Look at the boy's face. He's 14. He's daydreaming. Orphaned just after his birth by the death of his mother, look at the tenderness with which his father captures this moment. Titus grew to adulthood, married and fathered a daughter. He did not live to see her birth, dying 7 months later and predeceasing his father by a year. Accustomed to using his own image for portraiture, Rembrandt also employed his son and members of his household. This practice meant he was always daring in his compositions, always charting new territory. Here Rembrandt has jammed the front of the desk right up against the picture plane. The pencase and inkwell that hang over the back of the desk are almost tangible – objects you can almost go up to and touch. Note: I have not written of the drawings and etchings. These are interspersed throughout the exhibition, providing, brilliantly, a contemplative space between the paintings.